Beef Stew with Sweet Potatoes, a hearty and comforting dish that will impress even a fussy eater. The perfecct family dinner no matter the season. 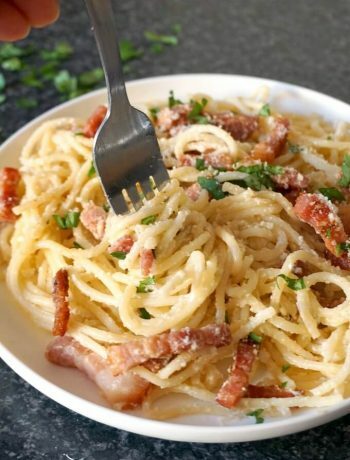 In need of meal ideas? It happens sometimes that I have no idea what else to cook. This lovely stew is so super easy to make and you can get on with other things while it is cooking, no need to stay there waiting. Because it is slowly cooked, the meat and vegetables are so tender, that they simply melt in your mouth. And it is so delicious, even our mother-in-low would praise you. A must try! Or, if you are after a more traditional beef stew with white potatoes, I have this heavenly Hearty Oven Beef Stew Recipe [GF] that is cooked in the oven instead of the stove top. 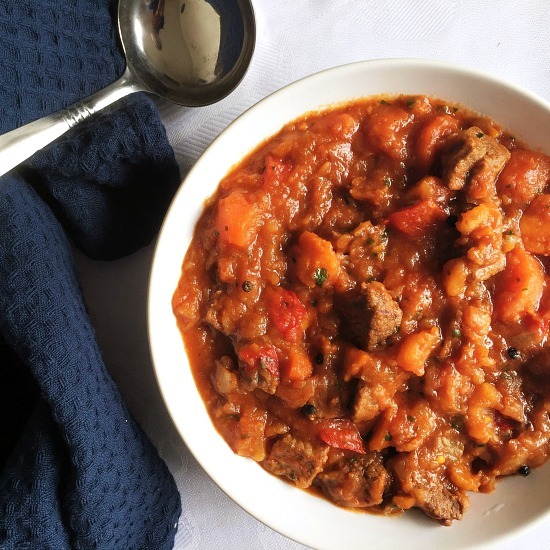 How do you make a beef stew with sweet potatoes? This stew is super easy to make, but it’s big on flavours, and goes down well with all the family. To make it, start by heating up some oil in a pan, and browing the beef. Note! Never overcrowd the pan, if you cook more beef, fry it up in batched, otherwise the meat is more steamed than browned. Once the beef is brown (but not cooked through at this stage), remove the beef pieces, add more oil if necessary, and sautee the chopped onion. When the onion is soft, add the beef, beef stock, bay leaves and peppercorns, and cook for at least an hour, or until the beef is tender. When do you add vegetables to the beef stew? The vegetables are added only when they beef is cooked, otherwise they will become mushy if cooked for too long. Cook for 15 minutes more or until the vegies are tender, then add the tomato passata (or any tomato sauce you like), season to taste, and your stew is ready. 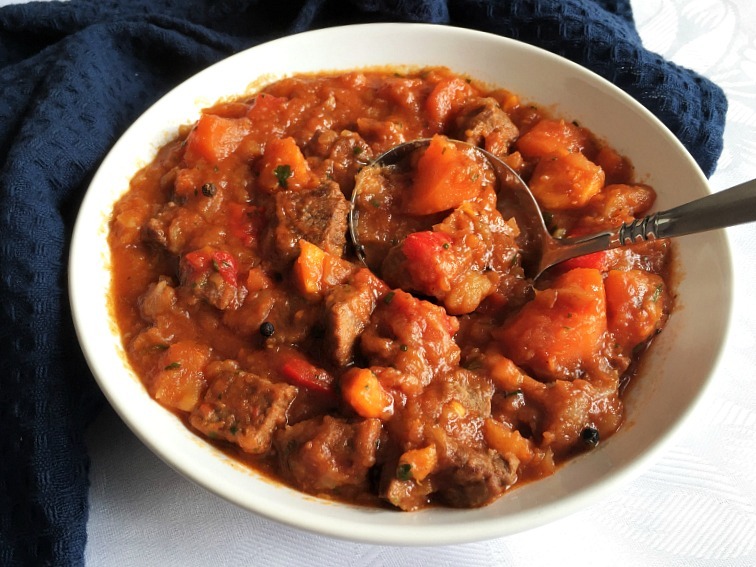 Can I make this beef and sweet potatoes stew in the slow cooker? Beef is particularly good cooked in a slow cooker, as the meat will be super tender, and melting in your mouth. Unlike cooking it on the stove, in the slow cooker you can add the vegetables right from the start, since they don’t cook as fast. And the amount of beef stock (broth) will be considerably less, probably no more than 2 cups maximum. Cooked on slow, it should be ready in 8 hours, where on fast in 4 hours. Anyhow, what is your favourite stew ever? Do you like hearty meat-based ones, or vegetarian or vegan stews? I would not mind any to be honest, as long as they are healthy and nutritious, the rest really does not matter. 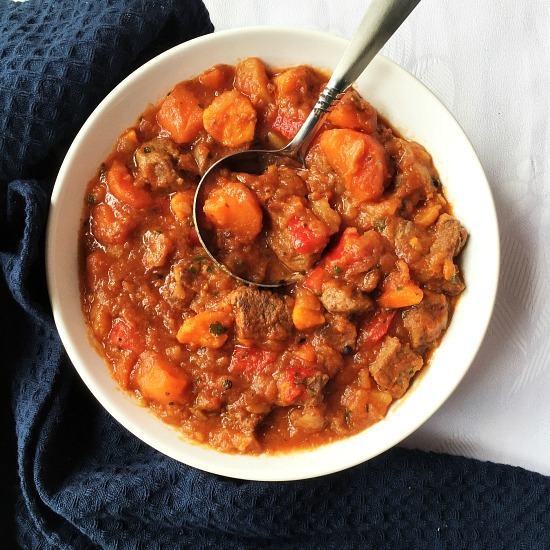 If you’ve liked my BEEF STEW WITH SWEET POTATOES or any other recipe on the blog then don’t forget to rate the recipe and let me know how you got on in the comments below, I love hearing from you! You can also FOLLOW ME on FACEBOOK, and PINTEREST to see more delicious food and what I’m getting up to. 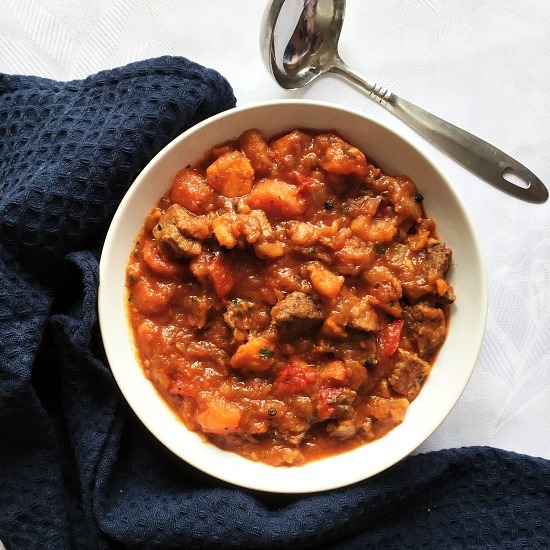 Beef Stew with Sweet Potatoes, hearty and healthy, it goes down a treat no matter what season. 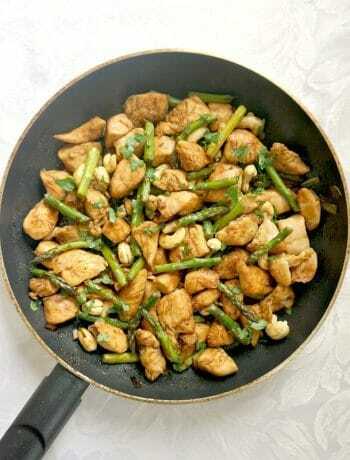 Add one tablespoon of vegetable oil to a frying pan and fry the beef to seal until lightly brown. Chop the onions roughly and fry them in a large saucepan until golden-brown. Add the beef, the beef stock, bay leaves and peppercorns and cook for at least 1 hour until really tender. Peel and chop the potatoes, carrot and sweet potatoes and add them to the pan once the beef is cooked, otherwise, if boiled for too long, they will be too mushy. However, l do like the vegetables really soft. Stir in the tomato passata, dried parsley and season with salt to taste. Cook for a further 15 minutes.